We have an upcoming family beach trip and I'm knee deep in packing lists. What's the deal with the massive amount of stuff you have to take when you're traveling with small kids?! It's overwhelming! 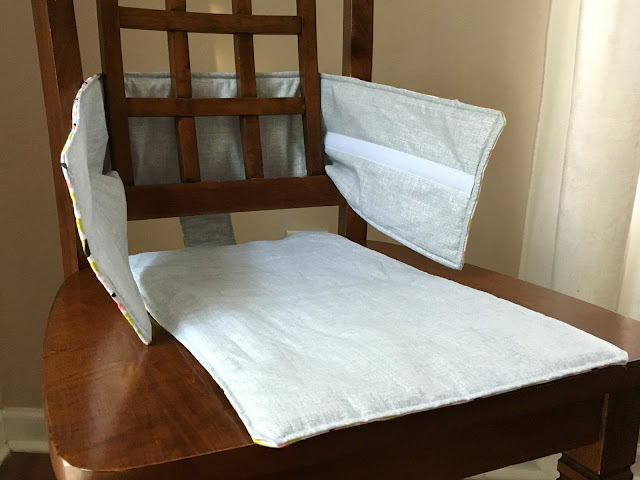 It's a great alternative that fits almost any chair and folds right up! Can't beat that! And for those of you that are already checking out on this post because sewing, WAIT. It's really not tough! If you can sew in a straight line with your machine, you're golden! Technically, you don't have to do two different fabrics. 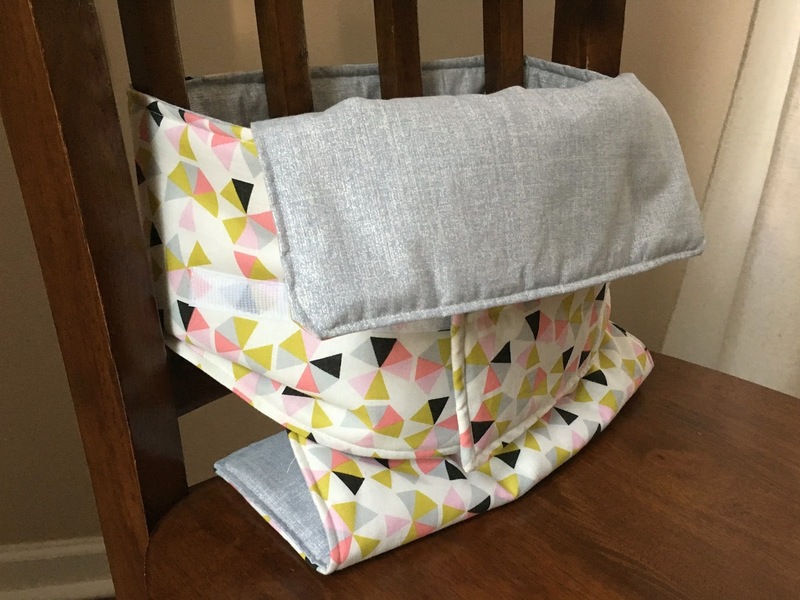 You can grab one yard of a single fabric and it's perfectly fine. But I like the pattern contrast on this one. So this project is made up of three shapes. Start by cutting them out. You'll need each shape from your bunting and your two fabrics. So a total of nine pieces. Strap piece: 37" x 7"
Seat piece: 18" x 12"
Connector piece: 4" x 3"
Then place all three of each shape together to be sewn. Imagine sewing this like you would a pillow case - sewing it inside out, then flipping it the right way. So put the pretty sides of the fabric facing each other and then add the bunting to one side. Pin like crazy! And just like sewing a pillowcase, you're going to leave an opening in one spot to flip the fabric right side out. The secret to this project is to make sure your opening starts in a specific place so you can easily fit your three pieces together. On the super long strap piece, the opening should be on the longer side, in the middle. One the medium piece, the opening will be on a shorter end, in the middle. And on the smallest piece, you don't have to worry much. Don't even bother sewing the ends. Just make sure the sides are done. If you're confused about the placement, scroll down and you'll see how it all fits together. The squiggly lines show where to leave a gap open. It helps me to mark that with a vertical pin. 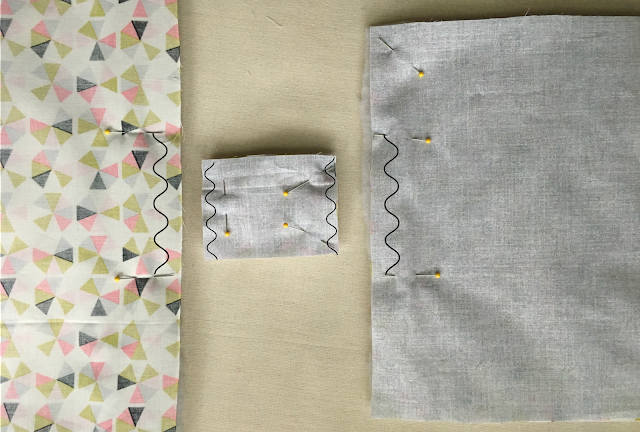 Once you've sewn around the edges, flip each piece right side out. Grab the littlest, tiny piece. It's going to serve as your connector between the other two. Line up one of the open edges into an the open spot on the seat piece. Pin in place. Sew all the way around the very edge of the seat piece. This finishes off the seat piece while also attaching it to the smaller connector piece. And last, add the velcro! I attached a long piece to the straps. Remember, one on the inside end of the strap, one on the outside of the other end of the strap. I would definitely go with sew on velcro this time. You'll want the most secure hold. Then give it a try! Eliza loved sitting like a big girl. 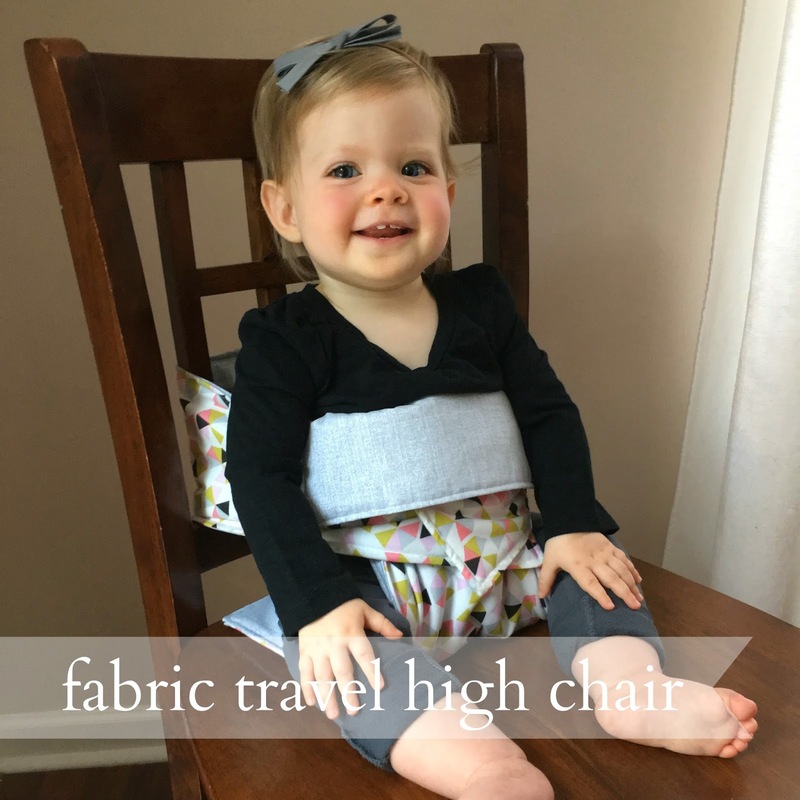 Of course, hang with your baby while they're in this travel seat. 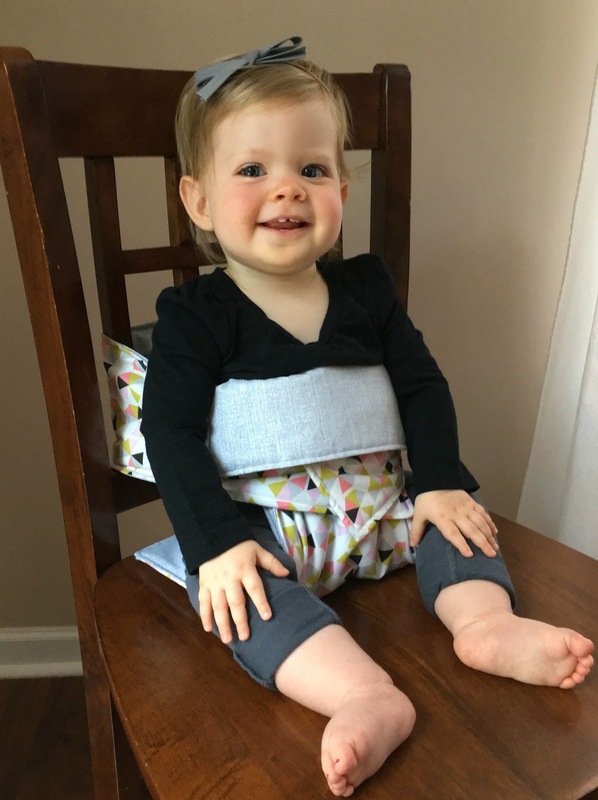 Without a five point harness, they won't be completely secure to walk away from. But its such a great space saving option to leave in the car for trips! High five for one less thing in the car! Thanks for the tutorial...I've seen a few of these, but the photos make it all clear! Great idea, happy baby. I love this high chair cover, and thanks for the tutorial. I am going to have to try this!